The lives of the residents of this village changed 15 years when a German art teacher took up her student Amjad's invite and visited his village: Thatta Ghulam da Dheroka. An enterprising spirit, she asked the villagers about their craft. 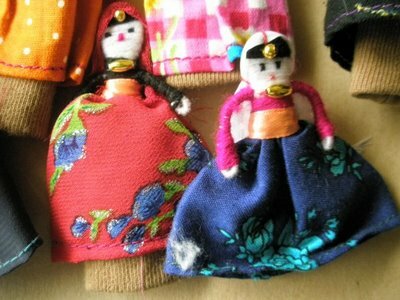 The women showed her hand-made rag dolls. The art teacher, Dr Senta Siller, told the villagers she could teach them to make refined hand-made dolls. Thus spun off a social enterprise in this 200-house strong village that has changed the way of life and living here. Women have a school. The village has a road. They experimented with alternative energy very early on, and now are undertaking community energy & food projects. The women from this conservative village now go on study tours with the Germans. The villagers have learned about sanitation, childcare, and eco-friendly living. Cleanliness is rewarded here. Above all, these changes were brought within the system, without breaking down the structure violently. The whole village participates in the making of the dolls, which represent the four provinces of Pakistan. The original doll is called, "Churail." You are welcome SAJS. I will be linking more of Dolls Village here in Dolls section in time.